The Uinta Fossil Journey begins in the museum rotunda, where its sentry – the giant Diplodocus skeleton, 90 feet from tip to tail – looms about and greets visitors. A short film, Uinta Fossil Journey – Stories in Stone, takes visitors into the canyons along the drive to Vernal, and shows a day in the field at two fossil digs, one for the Jurassic period and another for the Eocene. The landscape comes alive with stories of past life. Leaving the theater, a rock wall to the right contains a small ravine where visitors may try and distinguish fossils from among the washed out pebbles and debris. 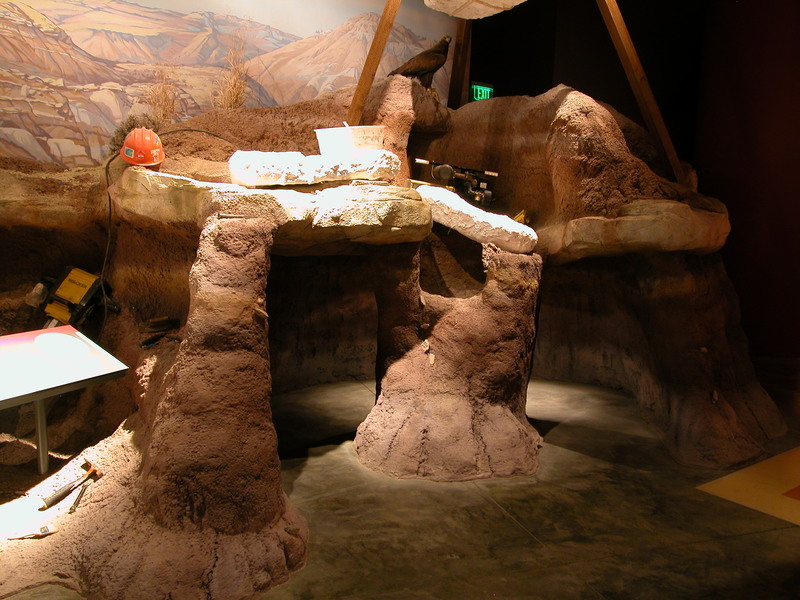 To the left, a dig site simulation illustrates the science and sequence of Jurassic fieldwork, including discovery and removal of fossils from rock. Everything changes in the Fossil Lab; visitors leave the field and enter a completely new phase of work, which includes worktables, lights, glasses, and tools. Pick up a bone and chisel, and prepare a fossil specimen. Younger visitors may do their own investigating in the children’s lab with books, models and puzzles surrounded by dinosaur models in their landscape. This grand Jurassic Gallery reveals life 145 million years ago with three large and impressive dinosaur skeletons: The Stegosaurus standing tall and long; and the unfortunate Haplocanthosaurus below the devouring jaws of an Allosaurus. A hallway of sounds and lights sends visitors 100 million years forward, with each step moving ahead 10 million years. 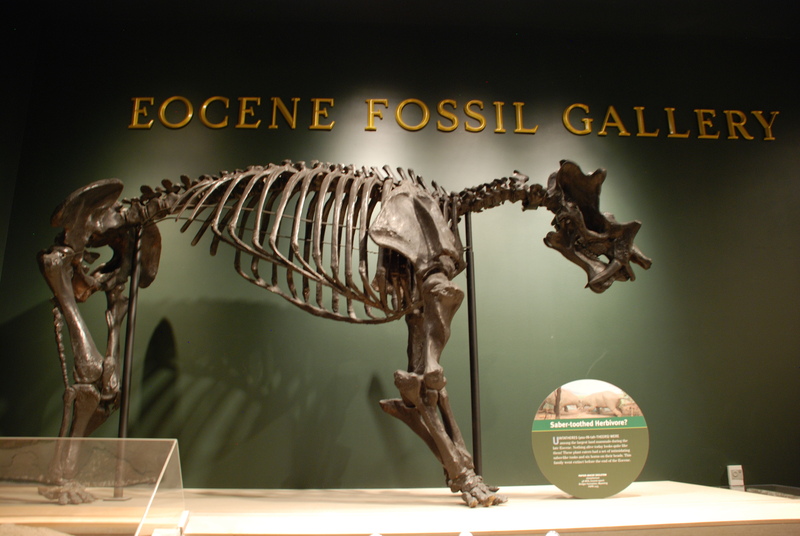 The Eocene Gallery features an entire wall of leaf fossils as high as visitors can see, with exhibits and other plants and animals from the Epoch in nearby display cases. There is a vast difference between this and the earlier Jurassic Gallery. In the next hall, an Eocene diorama recreates the sights and sounds of life along the shores of Lake Uinta, 45 million years ago. Visitors travel through the four main time periods in Earth’s history: Cenozoic, Mesozoic, Paleozoic, and Precambrian. A vivid mural helps visitors connect concepts about geologic time to the real places around Vernal, as experienced on the National Scenic Byway – U.S. 191 north from Vernal. Exhibits display fossils found in each period, and an up-close view of the model dinosaurs in the garden. The museum also includes special, changing exhibits on geologic time and contemporary natural environments, a classroom facility and new dinosaur garden for a full range of family educational opportunities. A wealth of information about the region’s recreational and educational activities is available at the Museum Information Center. 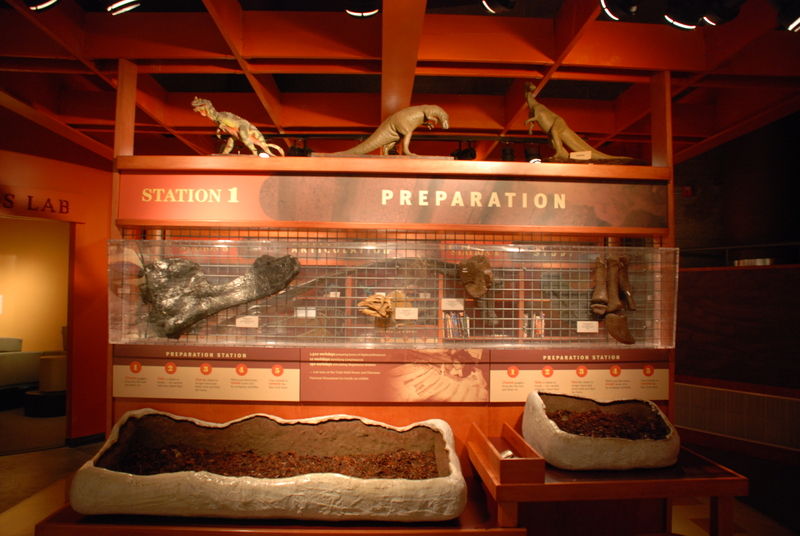 Leaving the Utah Field House of Natural History State Park Museum, visitors are now prepared to identify and discover the wealth of natural history found in the Uinta Basin. 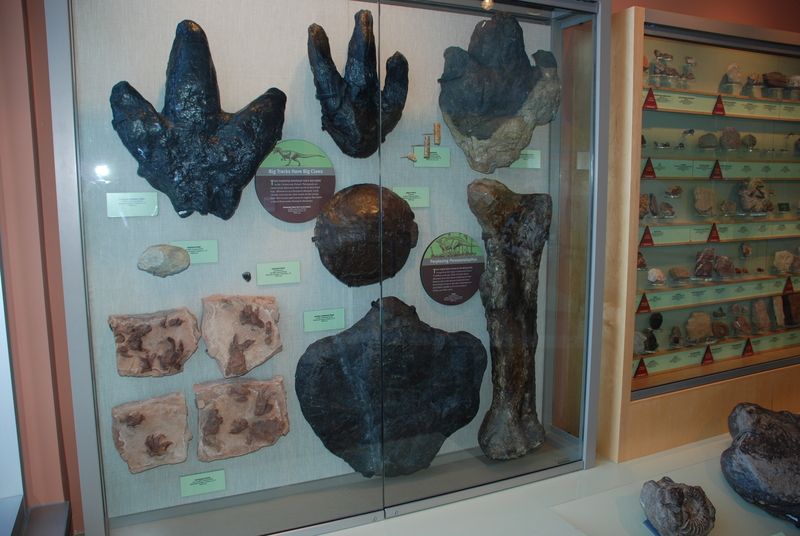 Whether they explore the dinosaur tracks at Red Fleet State Park or the quarry at Dinosaur National Monument just 20 miles away, the Field House is the first stop in their dinosaur discovery. Stop in in our Vernal Information Center for further information. A widely held belief is that any vertebrate animal that lived millions of years ago must be a dinosaur. Not so! Dinosaurs, just like all other groups of related animals, share common characteristics, and are descended from one ancestor. What were the traits these animals possessed that forever decreed them dinosauria? First, dinosaurs proper, meaning all dinosaurs except their descendants the birds, lived during the Mesozoic Era. The Mesozoic, which means the middle times, stretched from 245 million years ago until 65 million years ago. Dinosaurs evolved toward the middle of the Triassic, the first period of the Mesozoic Era, and went extinct at the end of the last period known as the Cretaceous. Most of the dinosaurs on display here came from the middle period known as the Jurassic. Next, dinosaurs were strictly land animals. Consequently any animal adapted for either flying or swimming, such as the winged Pterosaurs, or the paddle-finned Pliosaurs, could not be a dinosaur. Tremendously diverse in size, and shape, dinosaurs were supremely adapted to fill virtually all-available land- niches, making true the claim that they ruled the Earth, however, not the sea or sky. From kitten- sized carnivores preying on lizards and insects, through whale-sized herbivores capable of knocking over large trees, no food source was disdained. Their effectiveness at filling available niches, guaranteed both their ecological success, they were known to inhabit every continent, including Antarctica, and their longevity of 165 million years. This great success may be the direct effect of their unique pillar like leg posture; simply meaning their legs were placed directly under their bodies. Reminiscent of mammals and only a few known extinct reptiles, this advantageous leg position was a legacy passed on by their common ancestor. Pillar like legs encouraged the evolution of a variety of adaptations. Consider the incredible speed of the ornithomimids, the agility of the dromaeosaurs, the weight bearing capability of the sauropods, the bipedal locomotion of the theropods and the ability to migrate possessed by all dinosaurs. Migration allows a two-fold benefit of the use of an environment when conditions are advantageous, and the ability to leave when the location turns hostile. 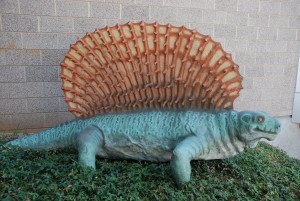 Edaphosaurus model in the museum gardens. 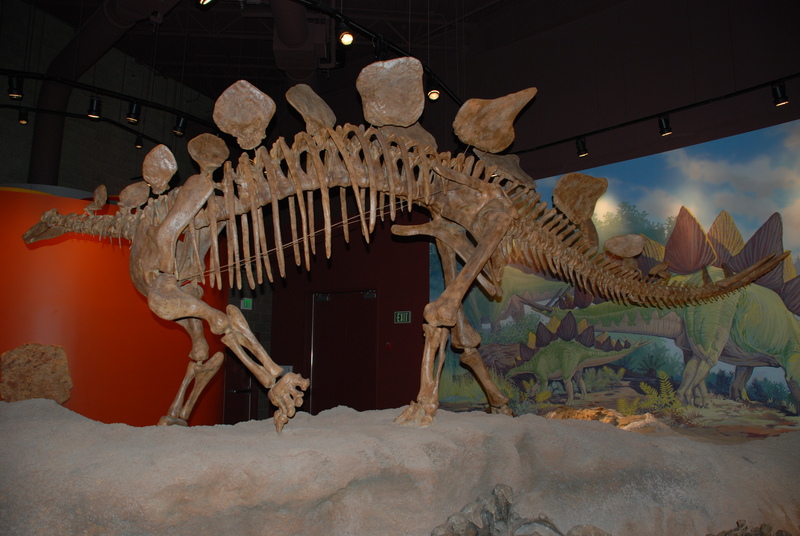 The animal on display outside the Paleozoic window is Edaphosaurus, a basal (early) member of the clade synapsida, which includes both therapsids (mammal ancestors) and mammals themselves. Both Edaphosaurus and his carnivorous cousin Dimetrodon are often confused for dinosaurs or lizards.